Everyone deserves to love their smile. Despite our best efforts to take care of them, wear and tear and dental problems still occur, and this can lead to them looking far less appealing than we would like. If you have imperfections such as discoloration or staining, chips or other marks on the outer face of your teeth, you may feel too embarrassed to smile or do any activity that draws attention to your mouth. Fortunately, there are cosmetic dentistry procedures that enable patients to address and improve various aspects of their smile. Dental veneers make it possible to completely change the appearance of the outer enamel of your teeth and therefore transform your smile. Dental veneers are tooth-colored coverings that are attached to the outer face of your teeth so that any imperfections are hidden underneath. Each veneer is custom-designed for each specific tooth and can be ordered singularly, if you have just one tooth that requires attention, or as an entire set for a total smile transformation. Although dental veneers are most often created from porcelain, it is possible to have them created from composite resin and zirconia. Once in place, in addition to covering the cosmetic problem, they can also strengthen the tooth and make it more durable. What cosmetic issues can dental veneers address? Stains and discoloration. 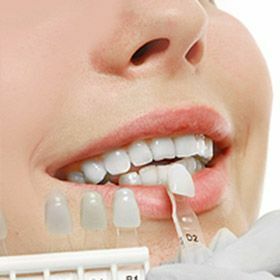 Some patients are sensitive to the ingredients used in teeth whitening, and veneers provide a successful alternative. They can also be used to improve the color of teeth where the staining was so severe that whitening has proved unsuccessful. Gaps between your teeth. Whether you have had gaps since your adult teeth came through or your teeth have shifted position slightly and allowed for gaps to open up, veneers can sit over the top and make your teeth appear to sit flush next to one another. Closing this gap can also make it impossible for bacteria to become trapped there and decay to form. Thickness and height of teeth. While we would all like our teeth to be uniform in appearance, many of us have some that are noticeably shorter or thinner than others. Veneers can address this problem and make your teeth look consistent across your smile. The process to fit dental veneers is simple. However, it does involve the removal of some of the natural enamel. This is done so that the veneer can be attached properly and doesn’t look too thick or unusual. The removal of the natural enamel is done using a local anesthetic, so you should not feel any pain, just some vibrations while the procedure is in progress. Each veneer can then be fitted, one at a time, and secured with dental cement. It is important to note that enamel cannot regrow. Therefore, once the removal process has begun you will always need a veneer on those teeth that have been affected. Fortunately, despite their fragile appearance veneers are very strong, and with proper care should last you at least a decade before you require them to be replaced. You should also ensure that you don’t use your teeth as tools, such as for opening cans, or habits such as crunching ice, as these are more likely to cause damage to your veneers that mean they require premature replacement.